This beginner shoulder workout will help shape and strengthen your deltoids. When the posterior deltoid muscles are strong, this helps to glide your shoulders back and your chest forward in a natural and effortless way. This, in turn, gives your spine the freedom to lengthen. When posture is aligned, a person appears trim and capable – as opposed to short and slouchy. 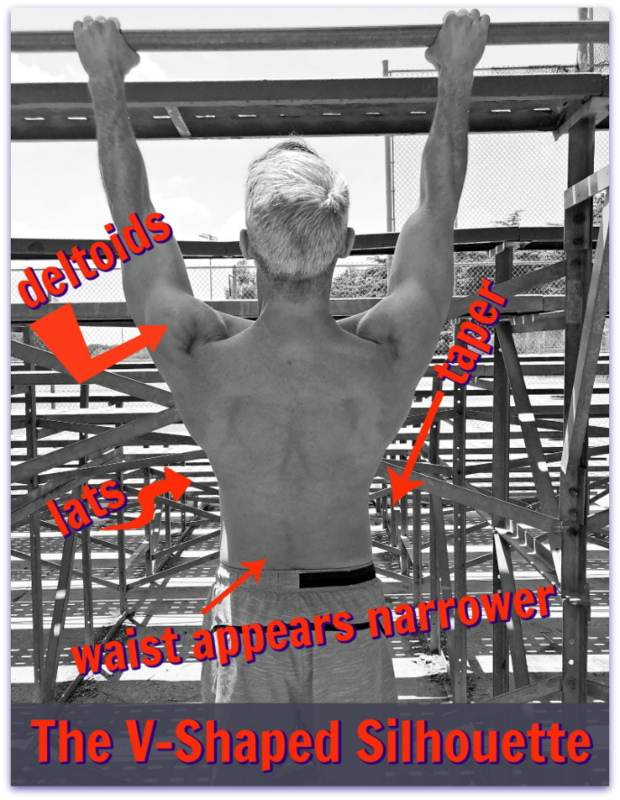 When you combine sculpted shoulders with properly conditioned lats (latissimus dorsi, the “wing” muscles that run along the sides of the back), it creates the illusion of a narrower waist. This is foolproof. If your deltoids and lats are properly conditioned, your waist will appear narrower. It’s a flattering look on both women and men. 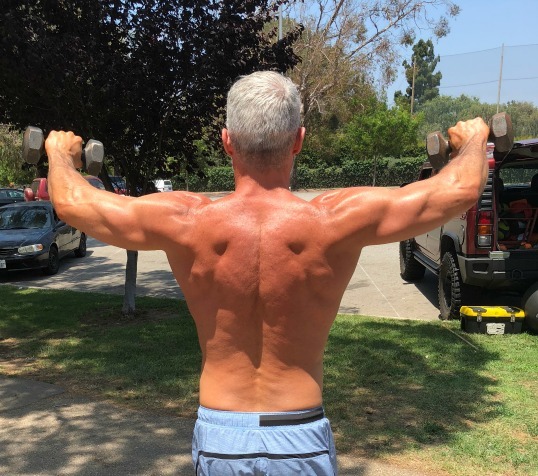 When training your shoulders, it’s helpful to keep in mind that there are three heads – anterior (front), medial (center), and posterior (rear). Many people forget to train their posterior heads, which can lead to an eventual forward slump of the shoulders. Fortunately, the following workout also contains exercises that specifically target the posterior head of the deltoids. Any time you’re training your shoulders, you need to be extra mindful about the rotator cuff. 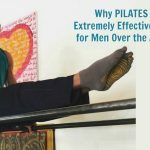 If you feel any sharp pains while doing these exercises stop immediately. I suggest beginning with light weights. Gradually, you can add more weight as your shoulder mobility improves. 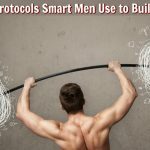 To get the clearest understanding of these shoulder movements, you’ll want to also see the short video provided with this article. 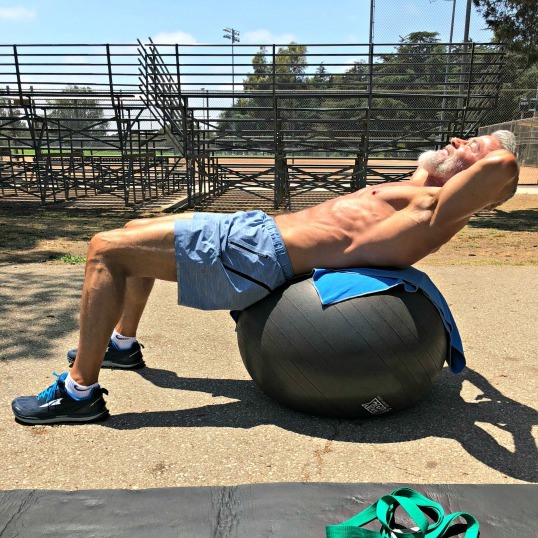 Author Dane Findley, age 53, uses a stability ball for crunches – to start off his beginner-level shoulder workout. 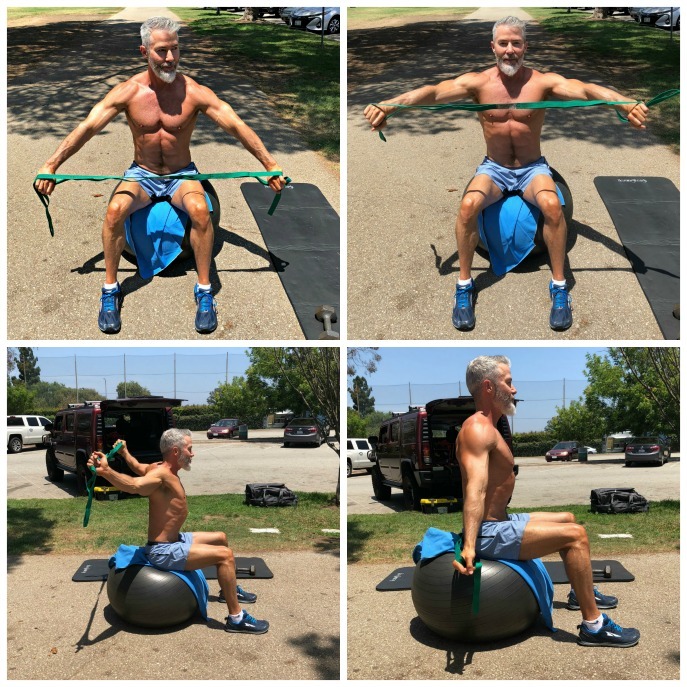 Abdominal Crunches on a stability ball; 10 full-range repetitions, finishing up with 10 pulses at the top. Keep the elbows back, this will open your shoulders and help prepare them for upcoming exercises. 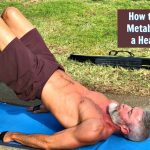 Initiate movement from core muscles, not neck muscles. Prevent lower back from over-arching – keep a bit of a scoop-up to your pelvis. Resist the temptation to shorten the spine. Keep a longer spine while crunching in order to give your abdominal muscles room to flatten. 10 reps, for the rotator cuffs, sitting on a stability ball. Use a band or pole, start with a wider grip; as you limber-up you can gradually bring your hands closer. Move cautiously at a slow speed in the beginning. 20 reps total (10 each side) on a stability ball. Be mindful in your movements, going slowly at first. Feel your obliques engage as you twist. 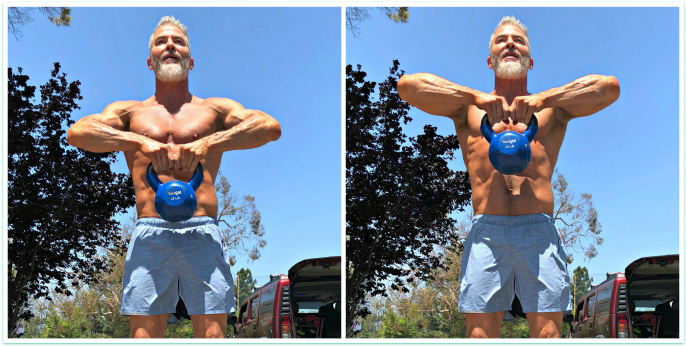 You’re also practicing stabilizing your shoulder girdle (for future exercises) by holding a dumbbell or kettlebell. Hang from a bar with your feet off the ground (if your shoulders are too immobile to hang – or your grip too weak – then you can keep your feet on the ground and just bend your knees so that you’re “almost” hanging). Allow your shoulders to fully relax up to your ears as you hang. Next, engage your scapula and press your ears completely down away from your shoulders (as if you’re about to do a pull-up). This can be a highly effective and therapeutic warmup for the shoulder area. For your anterior deltoids, row your arms up along the sides of your torso, leading with your elbows. Keep your arms fairly wide apart. Maintain a slight bend in your knees (resist the temptation to lock-out those knee joints with hyper-straight legs). Exhale all the air out of your lungs as you lift. The shoulder press is one of the classic resistance-training exercises. As you press the weights overhead, allow your palms to rotate a bit, organically, if they want to. Keep your navel pulled in tightly. Maintain your pelvis in a centered position (no sway back). Your ribs will want to pop out, but keep them compressed. This is important anytime you’re lifting weight over your head. This is a superset exercise (2 separate exercises, combined). After you do an overhead press rep, you move right into a modified “pec dec” by bringing your elbows together in front of your chest. 20 reps (10 reps each exercise). Bend over and keep your booty way up in the air with your hands on the ground directly under your shoulders. It’s okay to bend your knees. Drop-tuck your chin and relax your neck muscles. It’s your shoulders that should be doing the work as you bend-and-straighten your arms. It’s a peculiar (but effective) position, so do remember to breathe rhythmically. 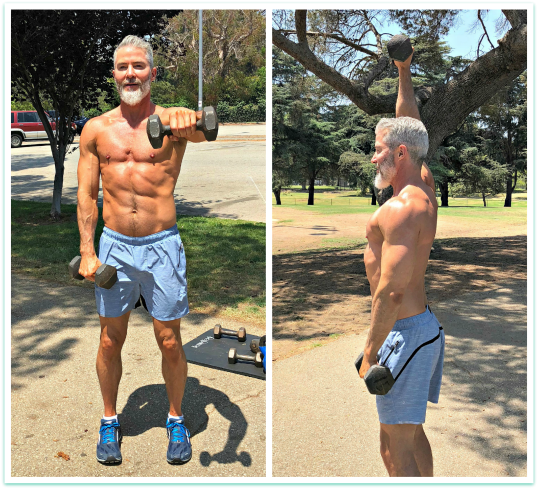 10 reps – but as you get stronger, increase gradually to 20 reps.
10 reps, holding a kettlebell or dumbbell. Keep the weight close to your body throughout the entire rep.
You’ll feel your traps working, too (the muscles at the base of your neck), and that’s a good thing. 20 reps (10 reps each arm). These particular raises are to be done full-range, bringing the arm up directly overhead. It’s tempting to swing the weight of your body and use momentum to move the weights. Instead, keep your body stabilized. No swinging. This is an extremely important exercise, as it trains the posterior chain. In the bent-over position, keep your belly button pulled firmly up to the sky (to protect your lower vertebrae). If you feel any discomfort in the joints, switch to a lighter weight. 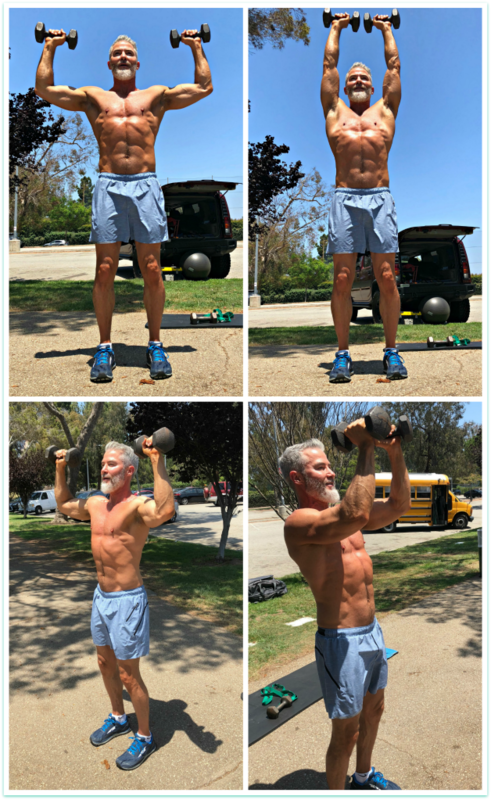 Executed properly with good form, the above shoulder exercises can help to give you defined, beautifully shaped shoulders and improve your overall physical conditioning. If you’re a man who wants to add significant size to his deltoids, shoulder mass gains are best accomplished by using heavier weight – even if you have to sacrifice the number of repetitions completed. As long as your joints can handle it and your form remains stabilized, train heavy. If you’re a woman who values shape and definition over deltoid size, then use lighter weights and increase the number of repetitions instead. Keep in mind that nutrition plays a key role in creating definition in the body. The standard, inflammatory, modern diet often creates too much puff and bloat to be able to see the natural sinew of the human body. Consider an anti-inflammatory diet instead. You can create a V-shaped torso silhouette by strengthening your shoulders. By adding more shape, symmetry, and dimension to your deltoids, your waist will appear smaller and your posture will improve. Try this shoulder workout. Stability ball, strap, a bar to hang from, dumbbells, and a kettlebell. 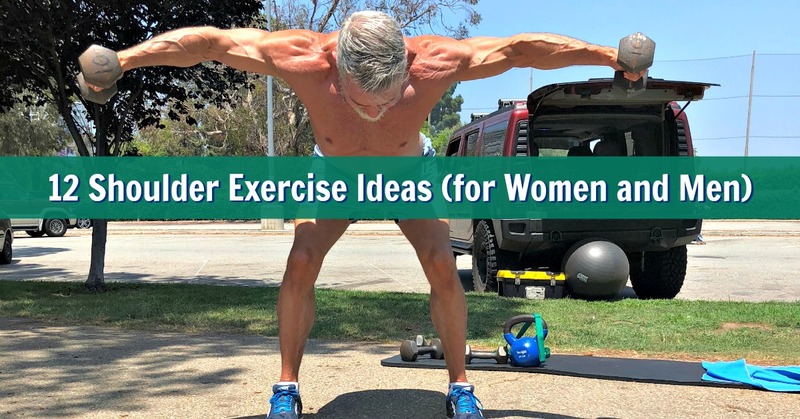 For women seeking definition, shape, and tone in their shoulders: do more repetitions with less weight. For men seeking strength and size in their shoulders: do more weight with less repetitions.